We’d love your help. Let us know what’s wrong with this preview of Vintage Made Modern by Jennifer Casa. Create modern heirlooms using vintage materials--a collection of 35 innovative projects showcasing the exceptional beauty in timeworn textiles. 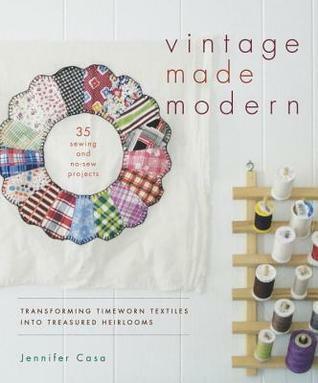 Vintage Made Modern is a book devoted to recycling just as generations before us have, utilizing timeworn textiles with histories of their own. With a little resourcefulness, gentle care, and some creative repurposing, the 35 i Create modern heirlooms using vintage materials--a collection of 35 innovative projects showcasing the exceptional beauty in timeworn textiles. To ask other readers questions about Vintage Made Modern, please sign up. Yawn. Why do so many craft books bore me? I love crafting - I love flipping through craft books. But seriously, most are pretty crappy. This one has a great idea -- reusing older fabrics, especially retired quilts, to create new amazing things. Great, okay. Now let's see some really amazing things. Except . . no. We get the same old things every other book has, only with fewer pictures and less "poppy" fabrics. So yes, I love the concept, hence the second star. But omg where was the wow? Another book full of projects of the sort people give you and you throw in a drawer because you can't think of what to do with them. My favorite was the steering wheel cover made out of a patchwork quilt. Really? Pretty things, clear if minimalist project instructions. Finally some up-cycling ideas for those odds and ends of vintage quilt pieces! As the only quilter in my family I inherited my great-grandfather's quilting stash; the unfinished bits and pieces have sentimental value but I've never known quite what to do with them until now. The directions are simple and straight forward and I can't wait to give some family treasures new life. The author also has a great section on laundering vintage quilts/fabrics which is a question I've been asked more than o Finally some up-cycling ideas for those odds and ends of vintage quilt pieces! As the only quilter in my family I inherited my great-grandfather's quilting stash; the unfinished bits and pieces have sentimental value but I've never known quite what to do with them until now. The directions are simple and straight forward and I can't wait to give some family treasures new life. The author also has a great section on laundering vintage quilts/fabrics which is a question I've been asked more than once and can be a sensitive subject for some. Thanks to Netgalley.com and Roost Books for early access to this title. I LOVED this book! There are some really great ideas here for upcycling and repurposing old, worn and vintage materials. I definitely want to try some of these. I like that the author displayed a lot of respect for the older fabrics, and I also appreciate her idea that saving older material in this way is a great way to remember and honor the past. The instructions and patterns all look fairly simple and easy to use, particul Thanks to Netgalley.com and Roost Books for early access to this title. This book had me from the Dresden plate on the cover. But it didn't stop there. There are a huge range of projects, some that don't require sewing skills (if that's not your thing.) Each project celebrates the original piece - be it a well worn quilt, a pillow case, or even just a tiny scrap - and puts the treasured fabric back into daily use, instead of being forgotten in a linen closet. I am so happy to add this beautifully photographed and easy to follow book to my crafty resources. Thank you This book had me from the Dresden plate on the cover. But it didn't stop there. There are a huge range of projects, some that don't require sewing skills (if that's not your thing.) Each project celebrates the original piece - be it a well worn quilt, a pillow case, or even just a tiny scrap - and puts the treasured fabric back into daily use, instead of being forgotten in a linen closet. I am so happy to add this beautifully photographed and easy to follow book to my crafty resources. In the first 2/3rds pf the book, almost all of the projects involve patchwork with the same fabrics and lots of hexagons. I like the repurposing of old fabrics but there are more than old quilts to cut up. The rest of the book is slightly more interesting but basically the whole thing was just bland to me. The instructions are fine and illustrated by line drawings. The projects are very simple and suitable for beginners. Advanced sewers don't really need this book. Thanks to Pinterest etc. it's hard these days to find a craft book that truly offers something new. This one does. Lots of ideas I wouldn't have thought of (and that I'd want to have in my house). Only reason I didn't give 5 stars, is that some projects could have used photos that made it easier to see the entire finished project. Perfect for anyone who is into shabby sheak. It had some interesting projects, and the book itself had a great layout, and pictures. Once I got over the idea of cutting up old quilts, I thought this book was cute and full of interesting ideas.